Sadly, on the 31st July, Seymour Papert died. I find moments like this strange. While it’s to time grieve, it’s also time to remember and since memories of Papert remind me of good things, I also experience a tinge of happiness. I would like to share my reflections. I hope this isn’t too self-indulgent, but key parts of my life led me to work with educational robots and they empathise with some of the experiences of this great educator. A few weeks ago I ran a Roamer workshop at the Crystal, in London’s docklands. The workshop, part of a peace and sustainability conference, introduced Going to the Seaside, a Roamer activity aimed at helping students understand water pollution. To my surprise, I found an old acquaintance in the audience. Derek Deardon, an electronics engineer, I’ve only seen him twice in 30 years. The first time was when a teacher invited me to his home, near Clapham North tube station. Anth Ginn used to teach the children of VIPs visiting London with their families. He called the meeting because he wanted Derek and I to design a Turtle robot. Anth introduced us to the ideas of Seymour Papert. This stunned me. Here was someone wanting to teach children to think. For me, this was an epiphany. Professor Seymour Papert, inventor of LOGO software, Educational robots, Lego Mindstorms and the inspiration behind Scratch. I came from a working-class family in Leeds. I was still 14 when I left school with no qualifications. My careers officer suggested I became a driver’s mate, but my father made me “get a trade”, so I became an apprentice engineer at Taylor Woodrow, textile machine makers on Water Lane. This became my first contact with Papert’s ideas. Since the notorious eleven-plus exam had sorted out the kids with academic futures from the herd, I had become one of the brighter kids left in the Osmondthorpe Secondary School mob. I was firmly on the road to drivers mate. Instead, I found myself in an engineering factory and with that came night school at the local technical college. In the day I built machines and at night I studied the science and maths behind the engineering. This linked me to Papert’s ideas of constructionism: it is the basis of my education and it transformed the my life. But I am getting ahead of myself. I got lucky. Harold Wilson’s labour government made it possible for working class kids like myself to go to University. I did so well at night school the University of Bradford offered me a place to study mechanical engineering. Four years later I had my degree, but I felt uninspired. I liked engineering, but I wanted something else out of life. At university, I had joined the pothole club and spent weekends in the caves of the Yorkshire Dales. I loved exploring, the danger, the slightly anarchistic attitude of cavers and the exciting possibility of “boldly going where no man has gone before.” This intense desire to find new, unexplored caves led me and 6 other guys to climb into an old army ambulance in the Northern English town of Preston. We headed south to Addis Ababa. I had joined the “1972 British Speleological Expedition to Ethiopia.” We set out to explore the countries caves and so I spent most of the next 9 months living in the wilds of Africa. Born in 1928 in Pretoria, South Africa, Papert, whose father was an entomologist researching the tsetse fly, spent his early years in the African bush. They travelled up and down the East Coast of Africa in the 1930s and hunted their food and fixed their trucks. Travelling the rough African “roads” is a car killer. My expedition ambulance first broke down, right on the border of Algeria and Niger, at least 6 hours of Saharan desert from Agadez in the south and 6 hours from Tamanrasset in the north. I just checked the Internet and I see people now call the route the Trans-Saharan Highway and they’ve paved 85% of it. Yet, they still claim it’s one of the most brutal and dangerous roads in the world. In 1972 the unpaved road was any path you chose in a 2-mile width of the desert. The road broke the suspension on our ambulance. Fortunately, the road had killed many other vehicles and their drivers had somehow walked away, leaving their dead trucks scattered along the route: a stark warning to other travellers. We rapidly scavenged some springs from a the carcass of a Mercedes and limped on. African roads make keeping trucks going a major effort. Little wonder Papert got so involved with them. This resonates with Papert’s famous story of how at as two years old he fell in love with automobiles and gears. Little wonder considering his living conditions. Our truck broke down 32 times: not trivial stuff, but problems like the chassis breaking in two in the Congo Jungle. A couple of Africans, who kept the machinery of a coffee plantation going with a welding set, came our rescue. The plantation was like a 19th-century textile factory, with gently flapping of pulley belts driving the machines from the line-shafts in the roof. These remarkable guys, made the contestants of Scrapyard Challenge (Junkyard Wars) look like novices. Each day, this environment would challenge Papert’s ingenuity and courage. It would also develop his sense of freedom and independence. Though a little strange, I understand why, in the quietness of a jungle camp, Papert would crawl under the truck and simply watch the gears turn. These experiences forged the practical and theoretical Papert. When he eventually went to school in Johannesburg, for the first time in his life he mixed with white people. And for the first time, he came across apartheid. This baffled him. Innocently, when he realised the illiteracy among the black domestic servants the ten-year-old Papert organised a night school for them. He didn’t know this was illegal. The authorities quickly stopped the lessons and Seymour took his first steps towards supporting the anti-apartheid movement. The illogical ideas bemused him. He asked, “How did his fellow whites, who normally seemed affable and reasonably intelligent, end up with such strange illogical ideas?” People made such silly arguments like, “These black people sitting at school desks would spread a disease to our white children!” ‘These people’ cooked their food and did their laundry! More of Papert’s intellectual foundation stones were in place. He wanted to know how people got their ideas: what made them think the way they do? These incidents started his interest in logic and philosophy. Papert claimed his knowledge of gears did more for his mathematical development than anything he learned in Primary School. Gears, serving as models, carried many otherwise abstract ideas into my head. I clearly remember two examples from school math. I saw multiplication tables as gears, and my first brush with equations in two variables (e.g. 3x + 4y = 10) immediately evoked the differential. By the time I had made a mental gear model of the relation between x and y, figuring how many teeth each gear needed, the equation had become a comfortable friend. He wondered why he found these ideas easy while others found it difficult. Yet these same people could quickly grasp ideas he struggled with. It wasn’t that Papert asked these questions, but he sought answers. His high school couldn’t satisfy his philosophical curiosity so they arranged for schoolboy Papert to attend university seminars on logic. The strands of his youthful upbringing had started to weave together. He argued for the possibility of formalising logic. He even ‘invented’ and built, what he thought was a unique machine that could prove logical statements. Clearly, he was not privy to the wartime secrets of Ultra, and the work of Alan Turing and Tommy Flowers building the code-breaking machines of Bletchley Park. 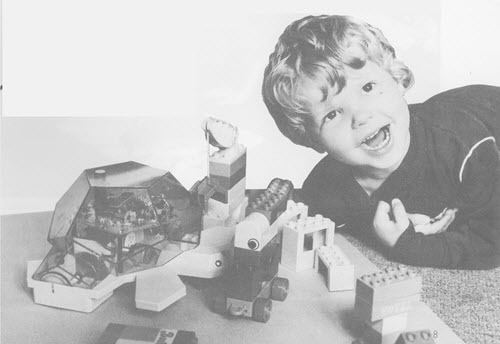 Nevertheless learning by building stuff had clearly become part of Papert’s personality. After High School, he attended Witwatersrand University and started studying philosophy. After a year he switched courses to mathematics and in 1952 he earned his first PhD. Not content with one doctorate he went to England and St. John’s College, Cambridge. As part of his studies, he spent one year at the Henri Poincare Institute at the University of Paris. While there he met with Jean Piaget. 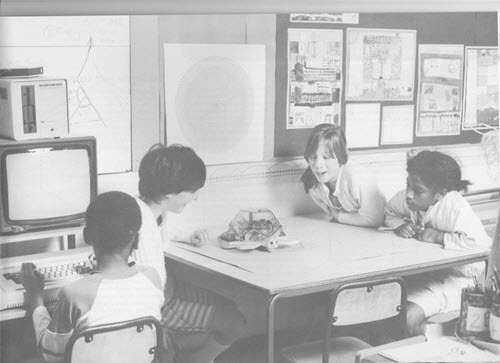 The eminent psychologist wanted to find out how children picked up mathematical ideas and Papert still wanted to resolve the question from his early apartheid experience. So Papert collected his second PhD. and in 1958 headed to work with Piaget at the Centre for Genetic Epistemology in Geneva, Switzerland. The two men shared many thoughts about the way people constructed their knowledge. The constructivist idea views learning from the cognitive structures we create. Any interaction we have with the world leaves its mark. We think about it, consciously or subconsciously, we use the new experience to reinforce what we know, or we use it to adjust our existing knowledge. Papert once described Piaget’s real message as learning based in experience. Slowly I began to formulate what I still consider the fundamental fact about learning: Anything is easy if you can assimilate it in your collection of models. Piaget used the term ‘mental structures’, Papert preferred the phrase ‘mental models’. This hinted at a slight, but significant schism: Papert felt computers had a role to play, Piaget had no interest in them. After 5 years in Switzerland Papert returned to England and went to work with computers at the National Physics Laboratory. About this time, Papert had a fortunate meeting with Marvin Minsky. Minsky then a member of the Massachusetts Institute of Technology (MIT) was making a name for himself in the fledgeling world of Artificial Intelligence (AI). Both men attended a conference in London and independently presented papers with different proofs, that more or less showed Perceptrons didn’t work. This was serious AI stuff. Several years earlier Warren McCulloch and Walter Pitts showed the same mathematics described the brain’s synaptic action and the actions of electric switches. Based on these ideas, psychologist, Frank Rosenblatt, created the Perceptron, a machine that could learn from ‘experience’. It mimicked the wiring of a brain’s many electrical interconnections. Coincidently, Rosenblatt went to the same Bronx High School as Minsky, this did not stop serious clashes between them at conferences. Papert and Minsky co-authored a book, ‘Perceptrons’, in which they frowned on the technology’s possibilities. Some people say the book killed off funding for work on AI networks. A decade or so later improved network designs got over Papert’s and Minsky’s criticisms and nowadays networks development is alive and well. Diagram of a perceptron network. The more times a combination of inputs happen, the more chances of a specific output. Early AI pioneers set themselves a challenge: Could they write a program to beat a person in a game of chess. At an Edinburgh cocktail party, John McCarthy, an MIT colleague of Minsky and Papert, met David Levy, Scottish chess champion and a grandmaster. McCarthy, who invented the word Artificial Intelligence, bet Levy £500 (then about $1200) that a computer would beat him at chess within 10-years. Donald Michie, head of AI at Edinburgh, used to play Alan Turing at chess in Bletchley Park took half the bet. A year later Seymour took £250 and other AI researchers piled in. In 1978 David convincingly beat the computer and won the bet, which then stood at £1250. David went on to design chess machines and his factory in China made the Classic Roamer for many years. Based on Minsky’s recommendation McCulloch invited Papert to join the faculty at MIT. However, Papert was still an active supporter of Trevor Huddleston’s antiapartheid movement, this severely delayed Papert getting a US visa. Eventually, Papert arrived at MIT and walked into Minsky’s office, sat down and the pair immediately started working on a problem together. Minsky describes their relationship as so tight he and Papert would finish each other’s sentences. The two men became the first directors of MIT’s Media Lab. Without specification, they would just start programming, quick and dirty. If you tried to tell them what do you would get nowhere at all… The hackers were creating the front of computer science. They did the first computer graphics, the first word-processing, the first computer games, the first time-sharing. Danny Bobrow lived near BBN so we met in his living room. Seymour presented us with the idea of LOGO. In those days people invented computer languages for specific purposes, like COBOL for business and FORTRAN for science. Papert invented LOGO for learning. 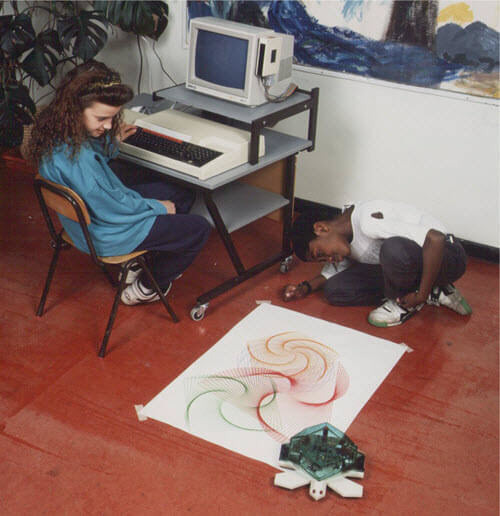 This creation brought together many of Papert’s life experiences. Piaget had given him a new way of looking at the gears of his childhood. He could ponder the formal mathematics, but he loved watching them and imagined himself rotating with them. He claims this gave him a cognitive and an emotional connection. He saw the computer offering more universality than gears. Because it can take on a thousand forms and can serve a thousand functions, it can appeal to a thousand tastes. We need to stop and remind ourselves this is the mid-to-late 1960s. The personal computers wouldn’t exist for another 10 to 15 years. The machines used in the LOGO trials sat in the BBN offices. Schools connected to them through the telephone, screens did not exist, the students used teleprinters. Papert’s vision had students learning through coding 50 years ahead of the current fuss about coding. He had not finished. 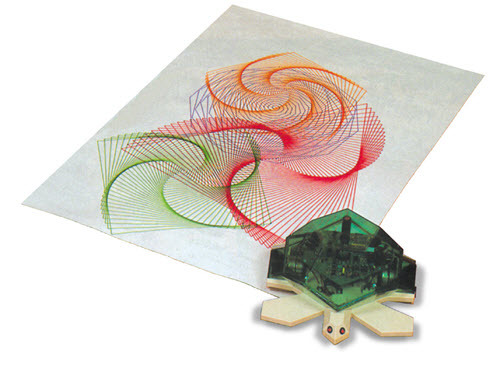 His next stroke of genius invented the Turtle robot, and a subset of LOGO, a whole new geometry called Turtle Graphics. 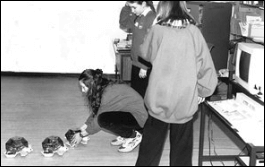 Instead of looking at lines the teleprinters’, students could watch the robot move in the same time and space as them. They could imagine being the robot and use their body to figure out how it should move and turn to solve a problem. with this act, Papert became the father of educational robots.Danny Bobrow had written the first LOGO language remembers when Seymour came up with the robot idea. We first went to a school and got the students to pretend to be the robot. The Turtle started because I wanted to find something which could be picked up by young children. Now I think of it at something that is just as valuable for people of any age and for the very young children. And again that is a general principle; what’s good for thinking is good for thinking whether you’re a 5-year-old or a sophisticated scientist. 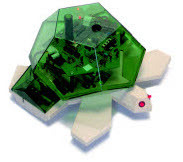 Papert asked Professor Mike Paterson, then a visiting English computer science graduate, to write a spec for the first Turtle robot. The result: an ugly looking creature resembling a trash can. 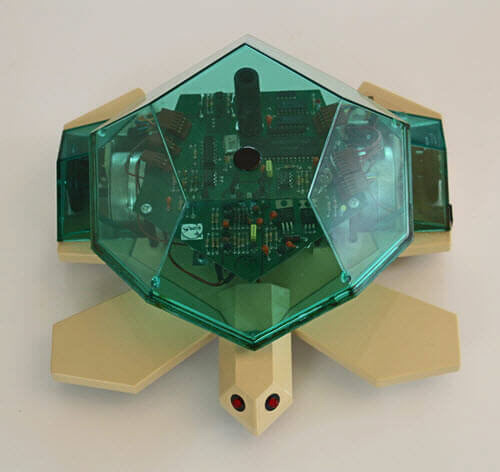 Later several other people designed Turtles, notably a wireless creature Wally Feurzeig got his engineer Paul Wexelblat to design. For some reason, Paul’s elegant design never got into production. So when I arrived at Anth’s home, all the Turtles got their instructions from the computer through an umbilical cord. A few twists and turns led to a tangle of wire. Anth wanted Derek and me to design a wireless version of the robot. After Africa, I’d worked at various labouring jobs, then taken an adventurous overland journey to and from Bradford to Rawalpindi in Pakistan. Even in those days, places like Afghanistan were full of interesting experiences. When I returned home I met Professor Tom Stonier who encouraged me to get back into engineering. So I spent about 10 years going from job to job as a contract design engineer. I worked on the design of oil rigs, jet engines, power stations, car production lines… an almost endless list. An engineer for hire quickly appreciates his skills. Despite years of training and academic study, my main skills turned out to be the ability to learn quickly and think and solve problems. Now here’s a teacher telling me about this guy who wants help children develop these skills. I thought it sensational and set out on a career in education. Within a week I was back in Bradford and formed an alliance with Tom Stonier to develop a Turtle robot. 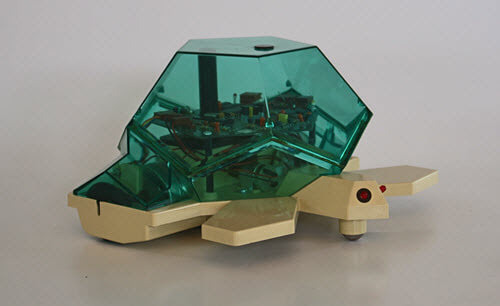 Papert always said he saw the Turtle as the first of many creatures that could serve as transitional objects. He turned his attention to working with students and Lego Bricks. He started to refer to these as cybernetic creatures. Papert never liked the way schools work. He coined the term ‘instructionism’ – that is you teach children, what you think they need to know. And what do they need to know? Usually, this equates to their future employability. Again this revives an old philosophical debate. Plato believed you should educate people for their role in society. Aristotle believed education should help the learner get the most out of their life. He knew educated people will always adapt. Papert was firmly in the Aristotle camp, his focus was always on children learning and finding better ways for them to learn. Seymour saw possibilities with Lego to bring together his passion for making things as a means of exploring ideas. In this, he mirrored my engineering experience and captured my thrill of exploration – but he was doing this with the youngest of children. Piaget and others like Vygotsky made constructivism an antidote to the instructionism Papert disliked. But with his work on cybernetic creatures Papert developed a variation called constructionism. Whether they use Turtles to draw pictures or Lego to make robots the act of building is a wonderful way to learn. Soon Lego realised what he was doing and started funding the MIT Media Lab and asked him to develop the intelligent brick which eventually led to the launch of Mindstorms and Lego Robotics. He handed over the management of the Lab to Mitch Resnik, who continued Seymour’s work with Scratch, the immensely popular successor to LOGO. I met with Papert twice. Once he invited me to his home in East Blue Hill, Maine. Overawed, my memory of the meeting is just a blur. I think we talked about his ideas, he introduced me to the work of Temple Grandin and asked me what I thought about is home decorating plans. He graciously signed my old battered copy of his iconic book Mindstorms. The second time was in the summer of 2006. Out of the blue, I got a message that Papert was in London and wanted to meet with me. He came to my office and again it’s all a blur. I was about to start designing the new Roamer and I babbled about my hopes and ideas. He had apparently called the Classic Roamer the best educational robot he’d ever seen. And he was equally encouraging about my new ideas and gave me several valuable suggestions. He expressed a little disappointment in what Lego was doing. He did not like their themes like Star Wars, his anarchistic tendency still favoured children following their own ideas. He wanted to know about our design and make product, Inventa. This had supported projects like Fleet Circus and fitted well with his cybernetics ideas. He talked about the prospects of working with the growing number of people home-schooling their children. He expressed his excitement about a new project in Portland, Maine. Maine Governor Angus King turned to Papert when he wanted to find innovative ways to improve education in the state. They started with young offenders aged 12 to 20, in prison for offences from theft to murder. Papert was in his element. The pilot program did away with the political control we impose on normal school. Here, everything focused on helping students explore their ideas through practical building projects. Just a few months later he went to Vietnam where motorbikes move in self-organising swarms. No rules apply, certainly not obeyed. He was crossing the road with an ex-student Uri Wilensky talking about how to model the flow of this chaotic traffic with Wilensky’s NetLogo, when a motorbike hit him. He never fully recovered. So now Seymour Aubrey Papert, born 29 February 1928; died 31 July 2016. Many things in his life story resonated with my experiences. He helped me find a passion in my working life and he gave me a way to follow it. My daughter, who is on a gap year before going to study architecture at Sheffield, met a fellow traveller in Burma. For some reason, she told the girl that I had developed the Roamer. The unknown girl responded, “I always knew when the teacher got out Roamer in our school, we were in for a good day.” It’s not the first time I’ve had my work validated in such a heart-warming way. But praise for such comments belongs to Seymour Papert. And I am a bit part player in the multitude of people he inspired to share his vision. Each of these people will have their own stories to tell and each person they affected will owe it to a life well lived. Thank you, Seymour. Mitch took over from Papert and MIT. Mitch is responsible for Scratch and he gave this talk at the Scratch Conference, which took place a few days after Seymour died. Scratch is, in many ways, a the next generation of LOGO. This TED talk took place a couple of years before Seymour died. A brief comment from Seymour’s Marvin Minsky on Papert’s achievements. 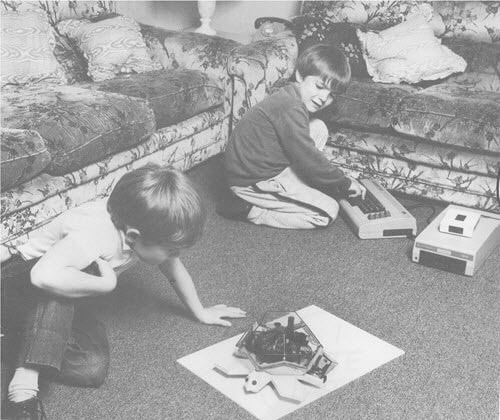 Cynthia persuaded Wally Feurzeig to invite Papert to become a consultant on the Navy Research project which led to the invention of LOGO, the Turtle and Educational Robotics. Information based on conversations and emails with: Seymour Papert, Cynthia Solomon, Marvin Minsky, Danny Bobrow, Wally Feurzeig, David Levy and Paul Wexelblat. Crevier, D. AI: The Tumultuous History of the Search for Artificial Intelligence. New York : Basic Books, 1993. Levy, D. Robots Unlimited: Life in a Virtual Age. Wellesley: A.K.Petersy : s.n., 2006. McCorduck, P. Machines Who Think. Natick : A.K. Peters, 2004. Papert, S. The Children’s Machine. New York : Basic Books, 1993. p. 86. Papert, S. Mindstorms, Children Computers and Powerful Ideas. New York : Basic Books, 1980. p. vii. Papert, S. Introduction? What is LOGO? Who Needs It? LOGO Philosophy and Implementation. s.l. : LCSI, 1999, p. pv to xvi.